I saw these little beauties being made on television and just had to give them a try them, they looked so simple and in reality were not far off so you can happily call this an easy chocolate tart recipe. It looks complicated but once you get started you will be pleasantly surprised at how easy it is. When you have added the cream and the raspberries it is just so perfectly delicious you will battle to keep your friends at bay. It makes 4 x 11cm diameter tartlets and I found 1/2 to be enough per person but if you have some srious chocolate loving mates, give them a whole one. It’s really important to measure the ingredients, so get out your scale or stop in at your local supermarket to buy one. 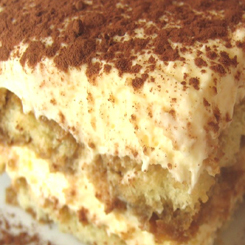 Use a food processor for the pastry, it is very straight forward. Take the flour, butter and salt and pop it into your food processor. Blitz it intermittently a few times and then give it a good blitzing until the mixture looks like breadcrumbs. Add a tablespoon of cold water and then blitz again for 20 seconds or so, the dough will start to stick together and now it is done. Tip onto a cool surface sprinkled with a little flour and bring it together into a ball. Don’t knead it, just form it. Now cover with cling film and put it in the fridge for about 30 minutes (a littkle longer is not a problem). Now take the dough and place onto a floured surface and with a rolling pin roll it out nice and thin, 3mm is about what you are looking for. The real trick is in the lining of the tart tins, you want to line them loosely so that when they cook they do not shrink too much. Line the tins and then prick the bases a few times with a fork and then pop them in the fridge again. Take the chopped up chocolate and place in a glass mixing bowl that has been warmed and dried (just pour a little boiling water into it and then dry it). Add the cream and butter to a pot and heat slowly until the butter has melted and steam is coming off the cream. Pour the cream into the chocolate and mix gently until all of the chocolate has melted, voila.. chocolate filling. Take the tins from the fridge, line with baking paper and fill with ceramic beads or dry beans (I got my tins and beads from Kitchenique in Woodmead, you want the ones with the loose bases) and bake them for about 7-8 minutes in a 180 Celsius oven. Remove the baking paper and beads and bake for another 10 minutes or until the pastry has a golden brown edge. Allow them to cool before removing the pastry. 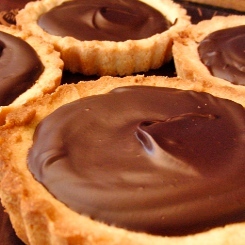 Once cooled, distribute the chocolate evenly between the 4 pastry cases and your tarts are ready. Whip some cream and place on the side topped with the berries. Bloody marvelous I tell you! Dont forget to see what competitions and giveaways there are, you just never know! This has got to be one of the easiest desserts to make and is so versatile you just have to try it. Make it with Enrista’s 3 in 1 coffee of chocolate for Coffee froth or chocolate froth or a combination of the two. You can have it as it is or dress it up with whipped cream and fruit and a few chocolate shavings but the froth is awesome. Imagine an aerated creamy jelly, just try it you will love it. Makes enough for 8-10 people depending on how you dress it up. The first thing you need to do is pop the tin of evaporated milk into the fridge to chill. Pop it in, in the morning for when you are ready, you want it to be nice and cold. Get 2 serving bowls for the 2 different flavours. Take 2 small mixing bowls and add 200ml hot water from the kettle and melt the 2 coffee sachets in one and the two chocolate sachets in the other. Mix it up with a spoon to ensure that the contents are completely dissolved. Then add a sachet of the gelatine to each and mix to dissolve. Now place the two bowls in a cool place to cool. Don’t put them in the fridge, we don’t want the jelatine to set, we want it to cool. In winter it takes about 10 minutes. 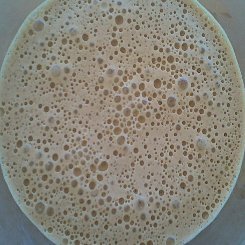 Once it’s cooled add the cold evaporated milk to a large bowl and with your electric beater, beat the hell out of it for about 5 minutes until it has increased in volume about 4 times and is fairly thick. Now put half of the cold cream into another mixing bowl and add the cooled chocolate mixture, beat it well for another minute or so and then transfer into a serving bowl, do the same with the coffee and then pop them into the fridge for about 10 minutes to set. 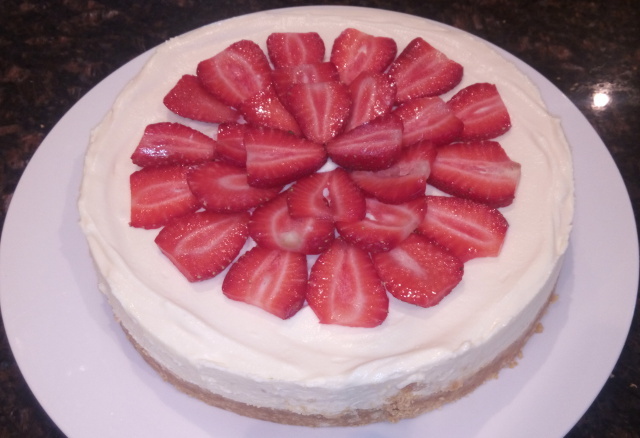 That’s it, simple and delicious, not too sweet and a texture unlike anything you have tried. The idea for this came from my mom who makes it with fruit flavoured jellies. Place a small pot of water on the stove to boil then place a glass bowl over the water but not touching it and melt the chocolate. In a large bowl add the catser sugar and the egg yolks then use an electric beater to beat the mixture until it is thick and creamy. Add the melted chocolate ensuring you get it all by using a baking spatula to clean the bowl. Beat again until well blended. In a separate bowl whip the cream until stiff, add to the chocolate mixture and fold in using a metal spoon. Don’t mix it, just fold it in gently until evenly distributed. Now take another bowl and add the egg whites and pinch of salt. Beat with your electric beater (be sure to clean the beaters) until stiff. Add to the chocolate mixture and fold in with a metal spoon until colour is uniform. If you are using alcohol, this is the stage you add it, together with the beaten egg whites. Spoon into cups or ramekins and chill in the fridge for a few hours. It will need at least 2 hours to set well. You can grate over a bit more chocolate or add a mint sprig, a dollop of cream… you get the idea. 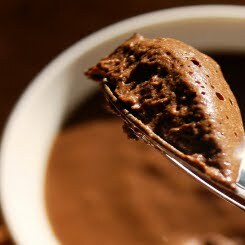 Truly one of the easiest and nicest tasting chocolate mousse recipes I have tried. If your eggs are in the fridge, take them out at least 20 minutes before you start. Heat your oven to 200 Celsius and lightly butter 6 rammikins, then dust with cocoa powder and set aside (not the measured cocoa powder). Break up the chocolate into small pieces (whacking it with a rolling pin does the trick) and place the chocolate and butter into a small pot on a low heat. Heat the mixture, stirring constantly until the chocolate has melted. Now take off the heat, add the vanilla essence and salt, stir well and set aside. Separate the egg yolks and the whites putting 3 whites aside for use later. Add the egg yolks to a large bowl and beat the yolks for about 30 seconds. Then add 1/2 the sugar(3 tablespoons) and cocoa powder and beat well until thick and glossy. Now add the chocolate mixture and mix with a metal spoon in a folding motion until blended and thick. Now in a separate bowl add the 3 egg whites and beat on high until you reach stiff peak stage. (If you lifty the beaters out of the mixture the peak does not collapse), now add the remaining 3 tablespoons sugar and beat until smooth and glossy as if you were making meringues. Add the egg whites to the chocolate mixture and fold in gently with a metal spoon. It must be evenly combined with a few white streaks. Spoon into the rammikins about 3/4 full. Place in the oven for 12 to 14 minutes or until the tops are cracked. Serve immediately in or out of the rammikins. If you are removing them from the rammikins, allow them to cool for a few minutes then slide a sharp thin knife around the edges first. Serve with a little vanilla ice cream or fresh beaten cream. Hot chocolate brownies and cream anyone? This has got to be the ultimate winter feel good dessert. It’s hot, its gooey and it’s choclate…. 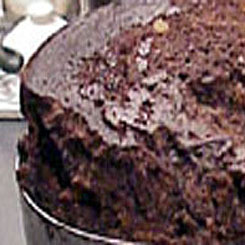 Lightly grease a small cake tin (20cm) or 8 ramekins and line the base with grease proof paper. In a pot over a low heat melt the butter, add the dark chocolate and stir until completely melted and remove from the heat. Add the caster sugar and stir, add the beaten eggs, sift in the flour and cocoa powder and stir to combine. You don’t want to mix it thoroughly. Lastly, fold in the chocolate drops and pour into the tin or ramekins. Bake in a 180 Celsius oven for about 20 minutes. The tops should be quite firm but not hard. Let them cool slightly and then turn them out and serve with a good amount of thick jersey cream or ice cream. 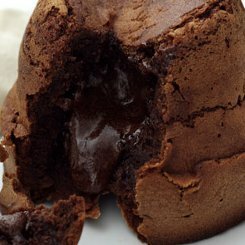 This is something to behold, its a kind of souffle, perfect pudding for all chocolate lovers. this chocolate recipe is not for the faint hearted, I burnt myself getting it out.. The anticipation and the smells in the kitchen made me lose my head I tell you. Could that mean I’m a chocolate addict.. YES and proud to be one. Lightly butter a 1 liter pudding bowl. In preparation for steaming bring water to the boil in a large pot. Cream butter, sugar and golden syrup until light and fluffy. Add egg yolks one at a time and beat thoroughly then Dissolve bicarbonate of soda in water, add and mix. Sift dry ingredients together twice. Add to cream mixture, alternating with the water. Beat egg whites until soft white peaks form. Gently fold into mixture. Pour half the mixture into prepared pudding bowl, crumble the flakes over and add the remaining mixture on top(this is the secret to its yumminess). Cover with grease proof paper and tie securely with string, make a handle on the top for easy lifting. The bowl gets very hot, so make the handle unless you have ovenproof gloves. Lower pudding gently into boiling water and cover with lid. Leave to boil for 2 hours. DO NOT open or the pudding will deflate. Remove from the water and serve ASAP with whipped cream. 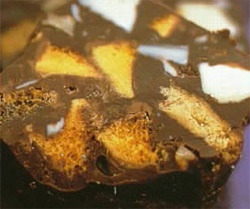 This is a creamy, melt in the mouth fudge recipe and remember, the better the chocolate the richer the taste. You will be hard pressed to keep these for longer than a day! For a really special change replace the mints with grated orange rind and 1 teaspoon of strong powdered coffee.